You run a fantasy camp of UFC fighters. You will begin with $200K. One by one, starting with the reigning champion from last season, we will draft active UFC fighters. Each fighter has a value, depending on their ranking. Champions obviously cost the most. Since there are currently no rankings, and they will be instituted DURING our draft, I will allow any women's flyweight fighter to be drafted as an unranked fighter, until the end of our draft, EXCLUDING women switching over like Shevchenko, VanZant(I think that last part is obvious), and montano. Example: You may draft Barb Honchak for 10K, irrespective of any rankings, UNTIL the end of the draft. When your fighter competes, your camp makes money. The higher ranked the fighter, the more you earn based on the scale below. You get a win/show check, and if earned, POTN/FOTN bonuses($5,000). We will go by the weekly rankings on UFC.com. Please note, if the UFC deems your fighter ineligible to receive performance bonuses due to missing weight, they will be ineligible in this game as well. If a fighter is ranked at one weight class, and they fight at a different weight class, they will get paid as an UNRANKED fighter. Another method of earning is a Camp Feud Bonus. If fighters from two different camps face each other, the winner will receive a $5,000 bonus. There is a $5,000 bonus for title challengers. As your fighter goes up in the rankings, he will earn your camp more money. ​Refunds of fighters are allowed. You will receive 50% of his/her respective value at the time of refund. You are allowed to refund one fighter every calendar week. The week begins at 12:00 A.M. EST on Monday. Another form of earning are side bets. If you and another player agree on a bet between fighters in your respective camps, post it in the thread, and I will confirm it. The voted upon limit is $10K in non-title fights, and $20K in title fights. I'll ensure that all bets are paid by kneecapping any and all welchers. 1. )You may add one fighter to your camp a week, IF you have the funds, and that fighter hasn't been drafted. 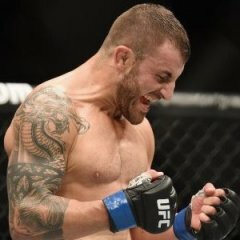 If you want to draft an available fighter, just post it in the thread. You can add fighters any time, except during a live event. The new week starts on Mondays at 12:00 A.M. EST. 2. )Your fighter has to enter the cage to receive your show money. 3.) Editing your picks = Automatic ban from the game. 4.) The ultimate goal of the game is to have the best camp at the end of the year. The criteria to determine who has the best team is based on having the most wins, most money, and most champions. - You have to draft at least four fighters. - You have 12 hrs to submit your choice, or you will be skipped. You can send me your pick via PM if you're coming up soon, and won't be around. - Don't edit your submitted pick, because players whose 12 hours have elapsed are allowed to submit their pick instantly. - No trading during the Draft. Once you have chosen a fighter he/she belongs to your camp until the draft is over. - If you miss a round in Round #1 and #2 you will be skipped in Round #3 and #4. - Player who drafts first in Round 1 will draft last in Round 2. Vice versa for the last player in the draft. He will draft twice in a row at the end of the first round, beginning of the second. Hey everyone, I will be taking over the game for Cash next season. For the next week let's gather some sign ups. Once you sign up, post any suggestions/rule changes to the previous game, and the members who have signed up will vote on whether or not we take on the new rule or not. This post will be the sign up and suggestion post. 1.) Changing the refund value to 50% of the fighter value, up from 25%. Reason- I feel that this will help more players last a little longer in the game, and produce a little more in-game activity. 3. )Draft order set by random draw - I will post a video or do a live stream using a randomizer with timestamps. 4.) 1 refund per week Vs. 1 refund per month (This rule wasn't really followed last season anyway). 5. )we need to separate the wallet again. funds and fighter value are separate entities and use different strategy. currently buying a fighter doesn't effect your standings where choosing to spend needs to have potential consequences. Welcome aboard, less WSOF guys to snipe this year though! are you open foe suggestions for criteria changes this year? 100%, fire away, like I said all suggestions will be considered and voted on. We will settle all rule criteria changes before the draft of course, so nobody gains an advantage either way! we need to separate the wallet again. funds and fighter value are separate entities and use different strategy. currently buying a fighter doesn't effect your standings where choosing to spend needs to have potential consequences. The Foreskin Horsemen are in!!!!!! for sure. at the moment when you buy someone your wallet just transfers, that's crazy. I get that there's a lot of criteria to go through and absolutely some should be combined but we need to go across it. also most finishes, maybe a finish bonus instead? food for thought. I'll have a skim throhgh previous years and see which ones worked best. 2.) Allow players to loan fighters to other teams for a specified amount of time for a specified price. Example, if player A needs money, and player B is interested in a fighter on player A's camp, player A can loan a fighter to player B for a term specified by players A and B.
I DO NOT AGREE WITH LOANING, IF THEY NEED THE MONEY, THEY NEED TO SELL THEM. 3. )Draft order set by random draw - I will post a video or do a live stream using a randomizer with timestamps. I AM HAPPY FOR THIS TO OCCUR, OR AS PER PEOPLE SIGN UP? 5. )we need to separate the wallet again. funds and fighter value are separate entities and use different strategy. currently buying a fighter doesn't effect your standings where choosing to spend needs to have potential consequences. HAPPY WITH THIS, HOWEVER HOW DOES THIS EFFECT THE FINAL OUTCOME. POTENTIAL CONSEQUENCES??????? 5. )we need to separate the wallet again. funds and fighter value are separate entities and use different strategy. currently buying a fighter doesn't effect your standings where choosing to spend needs to have potential consequences. HAPPY WITH THIS, HOWEVER HOW DOES THIS EFFECT THE FINAL OUTCOME. POTENTIAL CONSEQUENCES??????? LOL @ Oz crying to change the rules. "I didn't win last year, so those rules are stupid. We gott a change everything!" these were introduced this year m8 and clearly haven't worked for the majority. Oh look we're changing the rules back to how it worked last year... I'm shocked!!! Only because one guy didn't win, and he's the biggest whiner. "I lost, so I'm going to round up and say everyone hated the rules." No simply because you and Bubba had no ****ing idea... Oz is used to losing. No simply because you and Bubba had no **** idea... Oz is used to losing. You do realize OP isn't any fonder of you than me, right? I don't think you need to bother with this thread. I'm not playing with whiners. If FH or Bart or any of the people who cry on here daily are in, I'm out. I actually didn't want to play but NOW I'm considering it. A cancer like you spreads I actually didn't want to play but NOW I'm considering it. question is are you going to start playing straight away or will you wait till August to play properly? You'll have to get OP to consider it first. On the current path you're on, which is your usual path, I doubt you need to worry about it. Still early enough to beat your **** cause let's be honest you're the hottest of hot garbage in this game. cash, this feedback isn't personal. Quit acting like it is. The game works better for all when those two lines are separate. As they did the years before. IDGAF that I didn't win, not everyone can, there's too many variables for everyone to even get close to winning and despite what you think I actually understand that. It's bigger than me. But if you want to do your standard maneuver of "if they're playing I'm not playing" so be it. You've done an awesome job as Commish this year and to take it out. It would be cool if you contributed but if you want out then fair enough. I can participate, but I'm not going back and forth with children for an entire year. I've dealt with that in PL all year, and I'm highly annoyed by it. Personally, I would have to assume there was more action this year. There's like three or four teams with more fighters than I believe the top team had the year before. The only way to gain any separation was participating, and drafting more fighters. I feel like splicing wallet and fighter value into two categories would actually deter action. But that's just my two cents. Whatever you guys want to do. I don't care. I feel like I'm the favorite no matter what the rule set. I'd like to request we be able to freely release guys if we want instead of the one per month rule before. That would ruin the entire game cause people will just spam the release button. Buy release, buy release, buy release... but who am I talking to you guys know everything better anyway. Amirite?